Borderlinx | Buy Hewlett Packard and ship worldwide with Borderlinx. Cheap rates guaranteed. For over 70 years HP USA has been manufacturing personal computer hardware, software and services. Since 2007, HP USA has been the world's leading PC manufacturer. Started in just a small garage in 1939, HP USA is thought to be one of the most successful start-up companies of all time. Today, HP USA makes desktop computers, all-in-ones, laptops &amp; hybrids, tablets, monitors, printers, and more for the home or for work. HP USA's main clientele are individual consumers, small and medium sized businesses, and large enterprises, including within the government, health and education sectors. HP USA Laptops are attractive for their innovative technology, powerful performance and highly competitive prices. HP USA Computers are budget-friendly; HP USA Laptops range from $279 to $1349 so there is something for everyone. HP USA Computers function on Windows and Google operating systems; HP USA Tablets use Android and Windows 8. The HP USA 4G range offers computers and tablets that are equipped with "4G for life" allowing you free access to 4G Broadband service, for the life of your device! Shop HP USA Tablets for outstanding value, versatile technology and fun for the whole family! 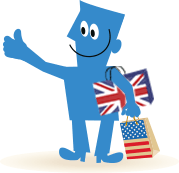 Shop HP in the USA and choose cheap international shipping with Borderlinx! Avoid any unexpected fees when you pay international shipping, tax &amp; duties upfront with Borderlinx, which you can calculate using our shipping cost calculator. A number of services are available through to make international ordering from HTC USA hassle-free, including concierge, free repacking, and consolidation.